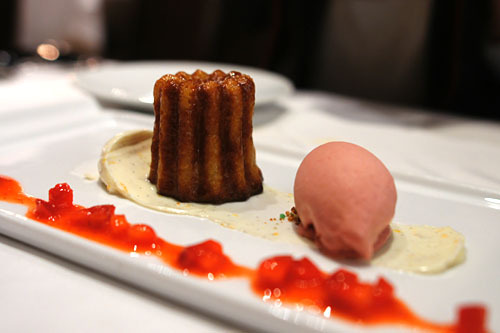 Ever since debuting in 2006, Florent and Amelia Marneau's modern French bistro has garnered its share of accolades, and has firmly been entrenched as one of the top dining destination in Orange County. 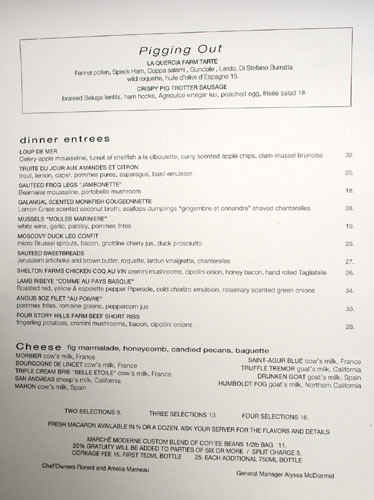 I'd had a very satisfying meal here back in 2008, but lured by the glitz and glamour of French eateries in LA, I'd not made it back since. Thus, I jumped on the chance to return when I was asked to go by readers Oanh of It's More Than Just Eating and Jin of Love Me...Hate Me...Feed Me.... In addition to being bloggers and all 'round foodists, the duo are also members of volunteer-run national non-profit organization Project by Project. Jin is the Director of Events for the SoCal region, and Oanh is in charge of recruiting local restaurants to participate in Plate by Plate, the group's annual tasting benefit featuring some of the Southland's most notable chefs and restaurants. The event is slated for August 14th this year, and past participants have included: Bashan, Bastide, The Bazaar, Fraiche, Grace, Joe's, Melisse, Mo-Chica, Sona, Spago, Valentino, and Water Grill! Amazingly, I was seated at the exact same corner table as last time! 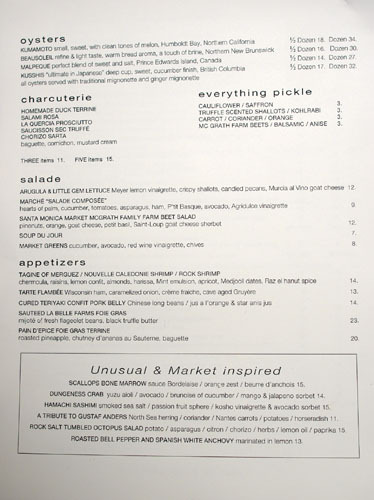 Marché's menu has always been large and varied, expanding well beyond your typical "bistro" fare. Click for larger versions. The cocktail list is short but sweet (literally). Click for a larger version. To start, I went with the Thai Vent (say vahn--French baby!) 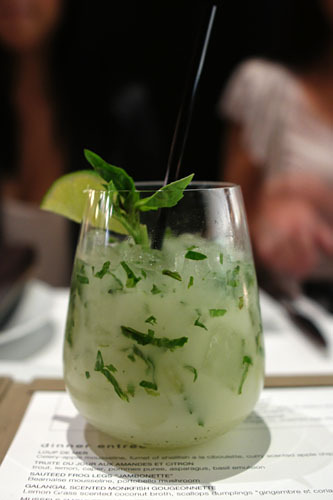 [$14], with mint, cilantro & Thai basil chiffonade, lime juice, vanilla scented rum, coconut milk, and ginger beer. I likened it to a mojito (Oanh was thinking more piña colada), with an unabashedly sweet attack leading to a lingering finish of vanilla-tinged heat. 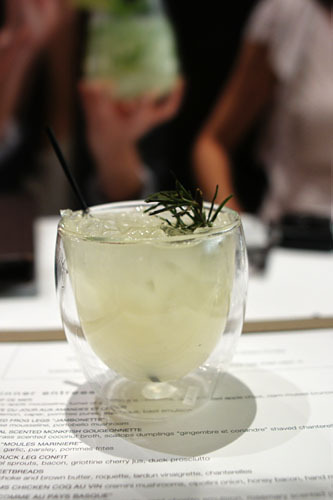 Jin ordered the Yuzu & Charred Rosemary Gin Tonic [$15], made from fresh yuzu, rosemary, and gin. It was a sour drink, with the gin nicely countered by the tang of the yuzu, and I really appreciated the use of the bitter rosemary. 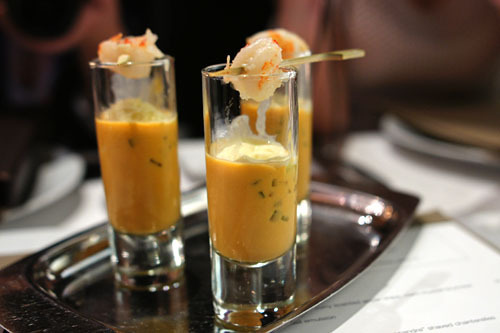 Our amuse bouche consisted of a tomato bisque with pastis ice cream and rock shrimp. I loved the sweet/sour interplay from the bisque, which was a perfect complement to the shrimp, while the pastis lent a hint of astringency on the close. Very good. 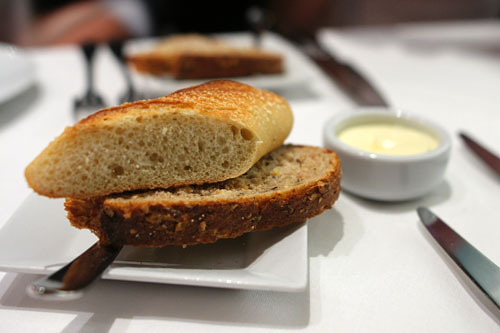 Bread service consisted of baguette and whole wheat, served with salted butter. We began with what turned out to be my favorite course of the night. The spice of the paprika and the salty chorizo formed a superb complement to the beautifully tender, slightly sweet octopus, while the lemon added just the right amount of zestiness. The potato, meanwhile, moderated the flavors, and also added an excellent textural element. 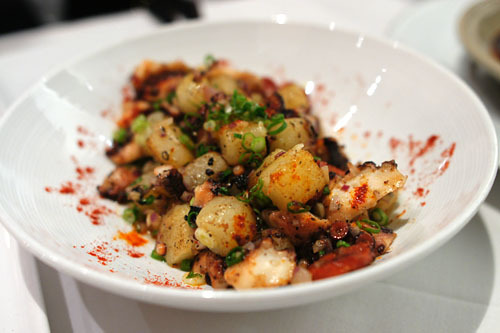 One of the best preparations of octopus I've had. Gustaf Anders was a Swedish restaurant formerly housed at South Coast Plaza, and, in my opinion, it was one of the best in all of OC. In fact, in my formative foodie years, it was one of the first places where I really learned to appreciate the simple pleasures of a well-prepared steak. As such, this dish was a must-order for me, and beautifully captured the essence of the restaurant. The herring, expectedly, was suitably briny, but was tempered deftly by the crisp carrots and onions, creamy horseradish, and mild potato especially. The whole hodgepodge of flavors actually reminded me of the great Salade d'Hargens that I had not too long ago at Church & State. This was a fascinatingly complex course, with a positively intriguing interaction between sweet and savory. 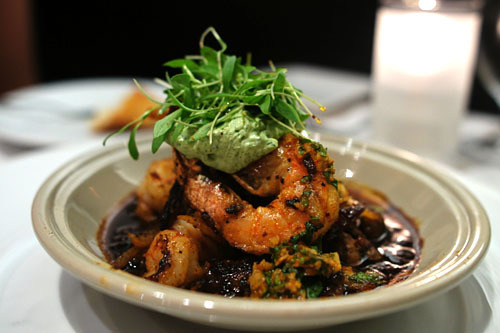 I really appreciated the meatiness, the substantialness of the two kinds of shrimp, while the mint really helped uplift this very aggressively flavored dish. In fact, the whole amalgamation had an almost chili-like character to it! Very nice. For our second round of drinks, Jin and I again went with cocktails, while Oanh stubbornly held on to her bubbly. I chose the Meyer Lemon & Griotte Cherry Sidecar [$13], comprised of Hennessy, Cointreau, griottine liquor, and Meyer lemon. 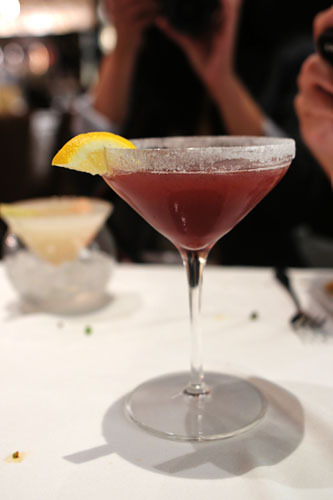 It's a twist on the classic cocktail that adds balancing notes of sour cherry into the mix--nice! 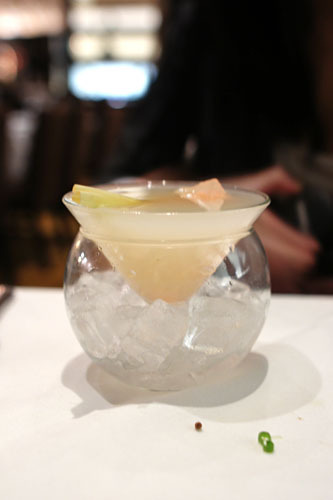 Jin had the Nigori Blossom [$15], a combination of lychee, Tozai Show Maiden nigori sake, elderflower, Hendricks gin, and a lemongrass-lychee popsicle. Think very strong, saccharine flavors of lychee, hiding most of the gin character. As regularly readers might know, I'm somewhat of a sausage fiend, so this was a must-have dish (especially with those trotters!). It didn't, however, turn out the way I expected--not necessarily a bad thing, mind you. 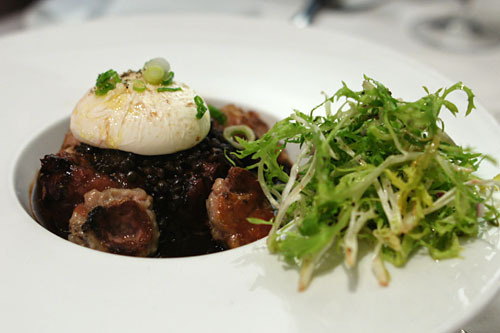 The sausage, naturally, was immensely flavorful (I wanted more), as was the ham, while the poached egg contributed an enveloping luxuriousness to the whole dish. The power of all this was lightened by the frisée, while the agridulce provided a nicely piquant counterpoint. My favorite part, though, was the great earthiness imparted by the lentils. La Quercia is one of the most respected names in cured meats here in the US, so how could I resist this tart, made with no less than four types of pork? We're talking about speck (smoked ham), coppa (shoulder/neck cold cut), guanciale (unsmoked jowl bacon), and lardo (cured backfat). 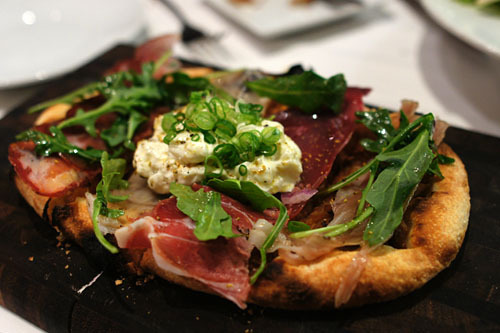 I loved the way the salty, savory salume was complemented by the mild, creamy burrata and bitter rocket. Great crust, too. Both Jin and I prefer cold foie gras, so we chose this over the sautéed variety. The foie itself was textbook, with a strong liver-y smack balanced by the sweet-spicy flavors of its pain d'épices treatment--very nice with the baguette. 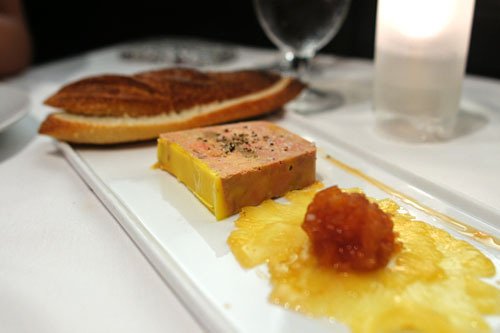 The included pineapple and pineapple chutney, however, rendered the foie overly sugary for my tastes, and were superfluous for me. This was definitely one of the more interesting preparations of scallops I've seen. The bivalves are usually fairly delicate in flavor, so I was surprised to see them paired here with three very powerful accoutrements: bone marrow, Bordelaise, and anchovy butter. 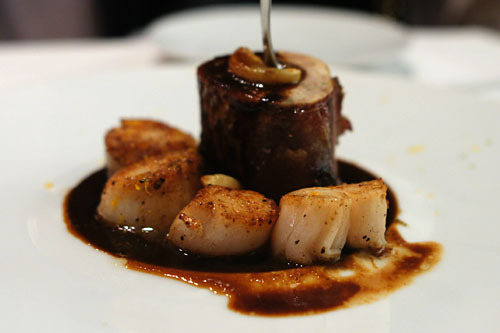 The marrow did add a considerable gravity to the otherwise tame scallops, but the Bordelaise was a bit strong for my liking, somewhat masking the scallops' inherent flavor. Pork belly is all the rage these days, so I suppose it was fitting to have it as our final savory course of the evening. 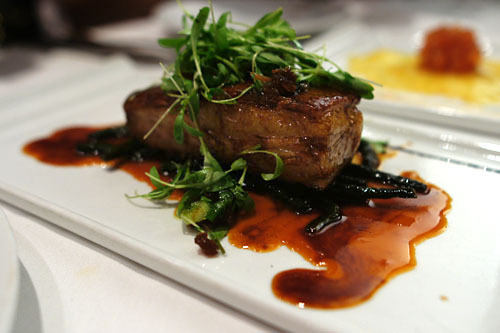 The pork alone demonstrated its typical tender, fatty, oleaginous character--that I had no problem with. However, the paired teriyaki sauce was far, far too saccharine, completely overwhelming the belly's natural porcine savor. I wasn't sold on those long beans, either. Fortunately, the greens did helped simmer things down, but even they weren't enough to save the dish. 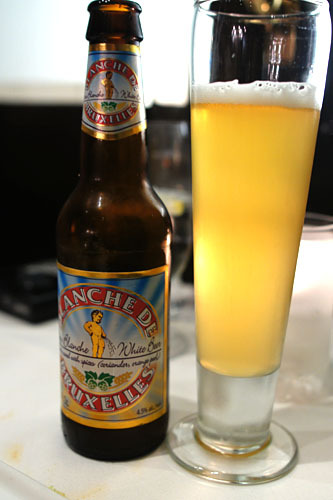 I decided to move on to beer at this point, and ordered up a Blanche De Bruxelles [$9] from Belgium's Brasserie Lefèbvre, the most interesting beer on an unfortunately short list. Done in the witbier, or white beer, style, the Blanche is spiced with coriander and orange peel, giving it a crisp, spicy, fresh and fruity flavor that we absolutely adored. Though we were quite sated by this point, dessert was still a must. Click for a larger version. 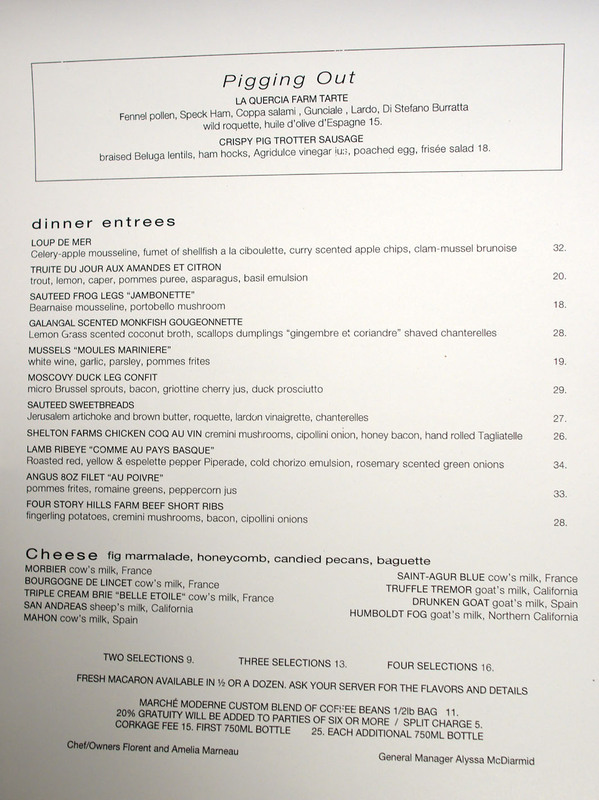 Ever since dining at Canelé in Atwater Village, I've been somewhat intrigued by its namesake Bordelaise pastry. Here, I appreciated the canelé's soft, creamy insides, but the exterior could've been a touch more caramelized. In any case, the relatively heavy, rum-tinged flavor of the pastry was nicely balanced by the use of tart fruit. Looking at dessert menus, I usually eschew ordering the "House-made sorbet and ice cream," but I'm glad we did this time, as this was truly some of the best ice cream I've had in a long while. 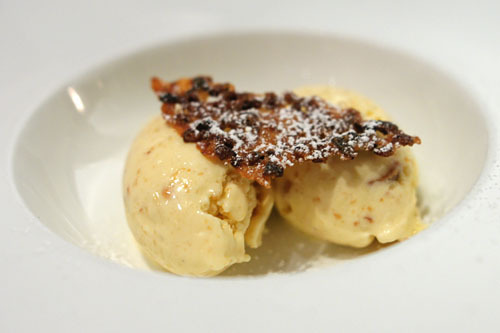 Its sophisticated, sweet but not too sweet flavor, augmented by the use of macadamia, really spoke to me, and the tuile added a wonderful textural counterpoint. Delish. Despite some missteps, I enjoyed this meal even more than my last experience here. 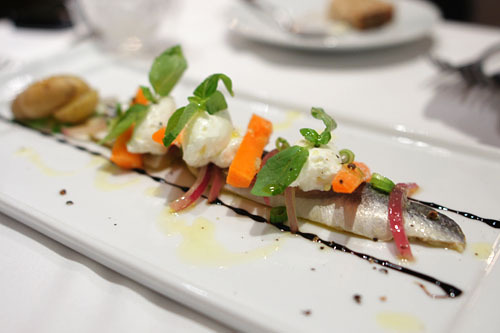 Sure, the food is firmly rooted in French tradition, but the modern flourishes are really what set the place apart: classic flavors, juxtaposed with the Marneau's global, California-inspired influences. Once again, a meal that reinforces in my mind why Marché Moderne is considered one of the top spots in OC. Totally agree with you, Kevin. Every meal I have had there, be it lunch, dinner or on a holiday - has been a very very very good one. 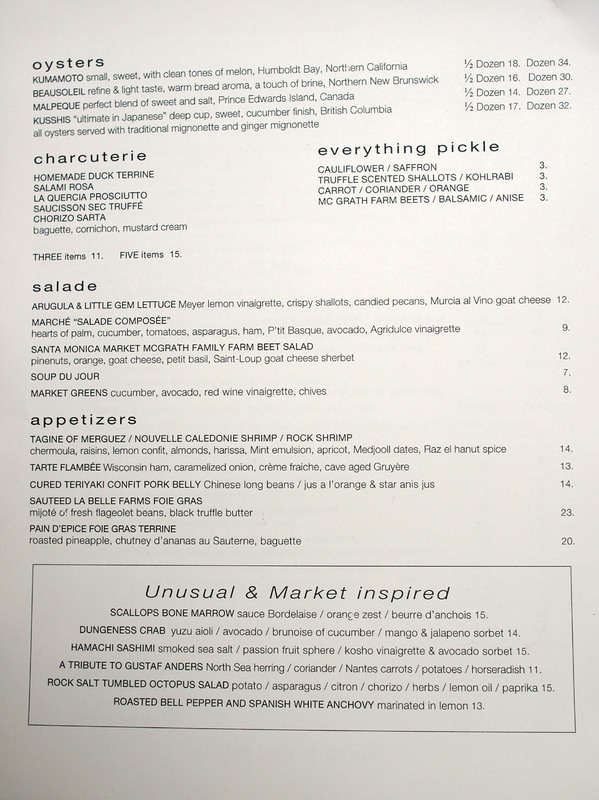 Their kumamoto and beau soleil oysters on the half shell with ginger mignonette are superb! Looked like an awesome meal! I guess I really should venture out to OC once in awhile to eat, huh? haha! Oh and great plug for PbP, Kevin! We really appreciate it! :) Hopefully we can all have a meal together in the future! Annie: Definitely want to get the oysters next time! But why the mention of Bone's? Holly: Yep I saw that. The lunch here looks like a great value. I enjoy Marche for the innovativeness that it brings to Orange County and it is actually vastly superior during dinner than at lunch. My only qualm with the place is that there is sometimes a lack of consistency with the quality of dishes. Some dishes would be amazing, some mediocre, some just downright awful and it's weird coming from a restaurant like Marche. I still applaud them though, they have some of my fav desserts.